Arp 78, also known as NGC 772, was originally listed in Halton Arp’s Atlas of Peculiar Galaxies because of its possible interaction with nearby high redshift companions via its extensive and diffuse spiral arms. Its redshift is listed in NED as z = 0.008246. This places the galaxy at a distance of 115 million light years using a so-called Hubble Constant value of 70 (km/s)/Mpc. The image on the right is from the University of Arizona’s Mt. Lemmon SkyCenter. It has been rotated and cropped to match the orientation of the original image used by Dr. Arp in his atlas. The bright object on the right is the likely true companion NGC 770. In a straight line above NGC 770 are two small yellow objects which are the high redshift companions in question. In addition to their distinct color compared to NGC 772 and NGC 770, their size and morphology indicate that they are most likely not companions after all but distant background galaxies. 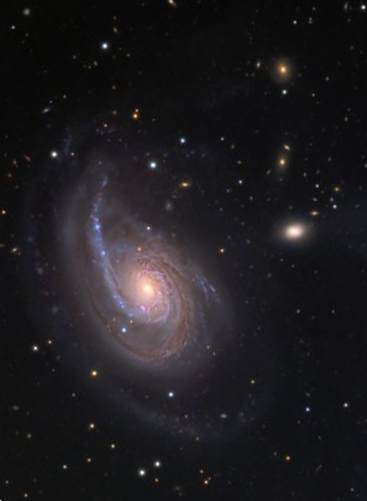 Modern observations may have clarified two possible redshift discordancies in NGC 772 but they have also revealed a new and more compelling one! In the late 1980’s a quasar labeled [HB89] 0156+187 was discovered near the galactic core of NGC 772. The exact location of this quasar along with two observed supernovae is shown in the image below generated using the free Aladin interactive sky atlas software. 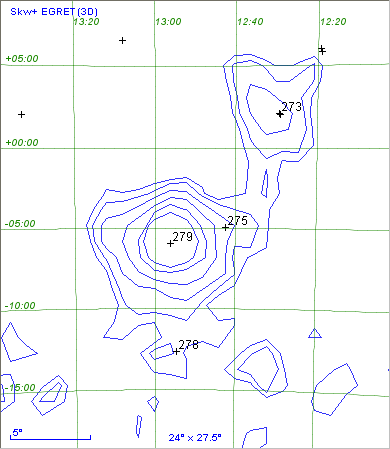 The light green square marks the QSO. Close examination of even the highest resolution images available reveal little more than bright knots of gas and stars in this inner most region of the galaxy’s spiral arms. It is difficult to believe that any background object could be visible through the density of stellar material present in this location near the center of the galaxy. Yet continued spectral analysis of [HB89] 0156+187 into the early 21st century indicates a redshift of z = 2.61 which would supposedly place it far behind NGC 772 at a distance of well over 11 billion light years! Obviously, as with most of the examples I have posted to this site, there is a need for higher resolution observations and closer examination of the objects presented. 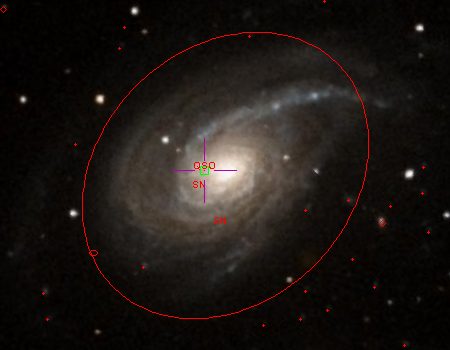 If it were not for the extremely high redshift of [HB89] 0156+187 it would be easy to assume by most scientists that the object was located either within or in front of the inner spiral arms of NGC 772, based on the data available today. Better observations may clarify the actual position of this quasar and place it in the background as in the case of the previously described companion objects observed by Arp. 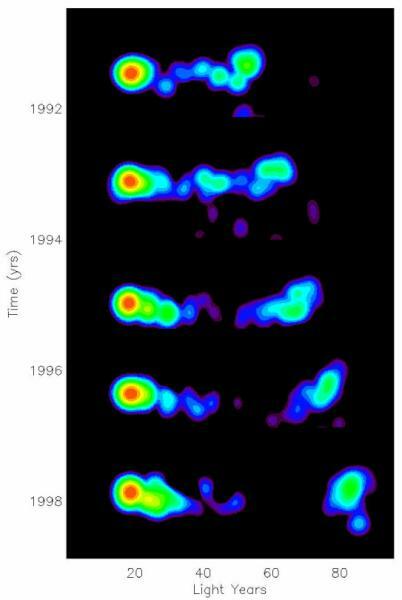 However, what will scientists do if better observations reveal that the quasar is indeed part of NGC 772? Will they finally be forced to reexamine the true nature of extragalactic redshifts and the validity of universal expansion? Either way it is important that research be continued and questions continue to be asked, regardless of whether or not we like the answers that result. NGC 1232 is a wonderful example of a spiral galaxy with a companion at the end of one arm. It is also a wonderful example of obviously discordant redshifts that have either been covered up or are simply ignored by mainstream astronomy. NGC 1232 and its companion, NGC 1232A, were first listed as Arp 41 in Dr. Halton Arp’s Atlas of Peculiar Galaxies published by Caltech in 1966. They are also discussed in Dr. Arp’s book Quasars, Redshifts and Controversies (Interstellar Media, 1987) and are mentioned in several papers published by him in The Astrophysical Journal. The following image is from the European Southern Observatory’s (ESO) 1.5m Danish telescope in Chile. I have cropped the original image in order to fit it on this page but it is otherwise unaltered. From the color and morphology of NGC 1232A alone it is very apparent that it is a part of its parent galaxy NGC 1232. 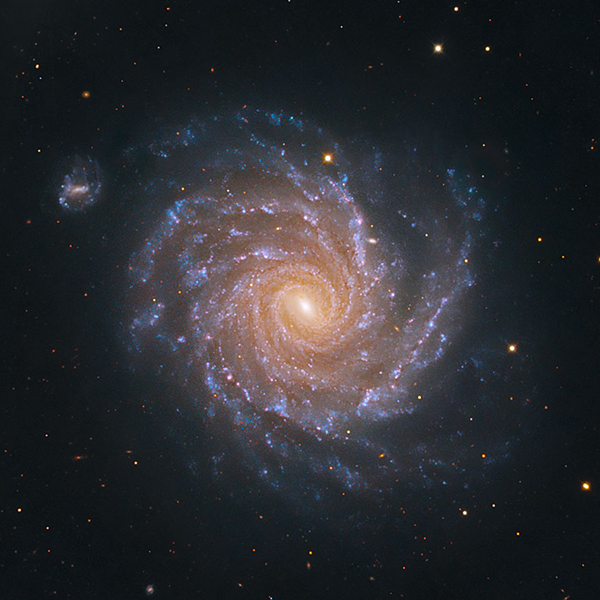 But if one traces the spiral arm to which NGC 1232A appears faintly connected back to the core of NGC 1232 a great disturbance and split in the arm is clearly visible. Perhaps, as Dr. Arp suggests, this is the path taken by the companion object after it was ejected from the core of the parent galaxy? Regardless of how the companion object reached its current location, I noticed during my research that its existence is either entirely ignored in the scientific literature describing NGC 1232 or it is described as being at the same or similar distance as NGC 1232. However a quick look at the NASA/IPAC Extragalactic Database (NED) reveals that not only does the companion object exist, based on its listed redshift it is supposedly located much, much further away. According to its listing on NED the redshift of NGC 1232 is 0.005347 z which places it at a supposed distance of approximately 95 million light years from Earth using a so-called Hubble Constant value of 55 (km/s)/Mpc. However, NED lists the redshift of NGC 1232A as 0.022012 z which supposedly places the companion object at a much greater distance of approximately 390 million light years from Earth using a so-called Hubble Constant value of 55 (km/s)/Mpc. It is no surprise then that these numbers have been suppressed by the scientific community. Otherwise astronomers and cosmologist would have to face the fact that extragalactic redshifts do not represent distance or expansion of the universe for that matter. And if that were true where would that leave the Big Bang Theory and their jobs? Another interesting feature of NGC 1232 is a small but bright object that appears right next to the aforementioned split and disturbance in the spiral arm leading out to NGC 1232A. Dr. Arp measured the redshift of this object at 28,000 km/s or 0.0934 z which places it at an astonishing 1.63 billion light years from Earth! It has been argued that this object is a distant background galaxy shining through NGC 1232 but there is no possible way a background object’s light could make it through the stars and dust of a galaxy’s spiral arm. Dr. Arp explains in his book Quasars, Redshifts and Controversies that even if a background object were to show through a thin area of a spiral arm its color would be deeply reddened. There are several examples of this reddening effect visible between the arms of NGC 1232. The image on the left is a vertical slice of a larger ESO photograph showing a couple of these examples. 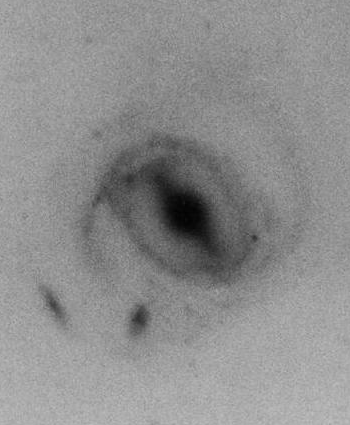 In this image the bright high redshift object is at the top, embedded or even possibly slightly in front of the disturbed spiral arm of NGC 1232. In the middle of the image slice is a small spiral shaped object just showing through the end of a gap between the disturbed spiral arm and another large arm to the right. Notice how red the object is compared to the one at the top. Toward the bottom of the image slice is another object of the same size and morphology peeking through the edge of a small band of stars and dust between the base of the arm on the right and another arm just out of view at the very bottom of the image. This object is also the same red color as the object in the middle and both look nothing like the object at the top which is actually quite blue in comparison. So once again we have a clear and unmistakable example of visibly associated objects that display greatly discordant redshifts thereby negating redshifts as a measure of distance and universal expansion. And yet once again the observations are completely ignored and once again I find it my duty to bring them out into the light for all to see. Eventually if enough observations are revealed their existence will no longer be able to be ignored and their implications will finally have to be faced and discussed. So as always I will keep posting to this site and thanking you for reading and encouraging everyone to pursue their own observations and to share any interesting ones! UGC 892 and its companion 2MASXI J0121174-003312 were first listed as Arp 67 in Dr. Halton Arp’s Atlas of Peculiar Galaxies published by Caltech in 1966. Unbelievably, the best image I can find today is still the same photograph used by Dr. Arp that was taken by the Palomar Observatory’s famous 200-inch Hale telescope back in 1966, as shown on the left. I cropped the original image a little to fit it on the page but otherwise it is unaltered. The reason I use the term “unbelievably” is that once again I find that decades have passed and I’m expected to believe that no large modern telescope has bothered to make another observation of what is potentially yet another example of discordant redshifts between two possibly connected objects. This somewhat grainy image shows what appears to be a small companion object just southwest of the primary galaxy UGC 892. The smaller object, 2MASXI J0121174-003312, appears to be disrupting the darker of the two main arms of the larger galaxy making it seem to appear connected to the larger galaxy. Of course the problem with this is that the objects’ redshifts indicate that they are supposedly at great distances from each other and therefore the smaller object could not possibly be affecting the larger one. 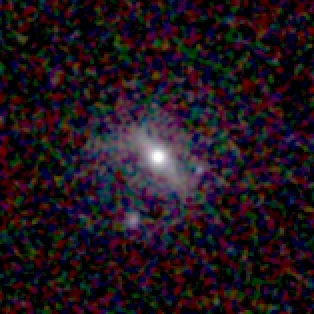 UGC 892’s redshift of 0.0175 z as listed on NED places it at a supposed distance of approximately 310 million light years from Earth using a so-called Hubble Constant value of 55 (km/s)/Mpc. The redshift of 2MASXI J0121174-003312 is listed on NED as 0.055 z which places it at supposedly three times the distance at approximately 967 million light years from Earth also using a so-called Hubble Constant value of 55 (km/s)/Mpc. One would think that such a discrepancy would garner a closer look by one of the several larger telescopes that have been built since the Hale in the past sixty years. Yet the only other observations I could find of Arp 67 were even lower resolution images produced by one-meter range telescopes such as the UK Schmidt and the retired 50-inch telescope at Kitt Peak including a set of infrared images produced by the Two Micron All-Sky Survey (2MASS) over a decade ago and listed under the name 2MASX J01211663-0032402. A composite of the three infrared waveband images taken by 2MASS is show on the right. Even in this fuzzy image and in the others mentioned a tenuous connection between the parent and companion objects is visible. Hopefully one day more higher resolution images of these objects will be made available from the powerful telescopes at our disposal and a literally more clearer picture of the situation will emerge even if it does conflict with current cosmological theories. As usual I will continue to pursue new data and report any new findings as they are published. And as always, I encourage all visitors to this site to pursue their own observations and feel free to contribute to those posted here or even submit new ones. Another “lesser known” example of discordant redshifts from the southern hemisphere is AM 2052-221 which is also listed in Dr. Halton Arp’s and Barry Madore’s A Catalogue of Southern Peculiar Galaxies and Associations (Cambridge University Press, 1987). It is also listed as AM 2054-2210 in Dr. Arp’s book Quasars, Redshifts and Controversies (Interstellar Media, 1987) and his articles published in Volume 236 and Volume 239 of the The Astrophysical Journal in 1980 and in a 1981 supplement. Again, as with NGC 1347, the best image I could find for this pair of objects is a photograph taken with the 48-inch UK Schmidt Telescope in New South Wales, Australia sometime in the 1970’s. I have cropped the original image a bit in order to fit it on this page but it is otherwise unaltered. As with many of the Schmidt Telescope photographs of the time the image quality is somewhat grainy. However, it can be clearly seen that the smaller of the two objects is trailing a stream of material that curves back toward the larger object possibly connecting to it within the diffused arm on the larger object’s north side. But this begs the same question as with NGC 1347. If they are physically connected how can their measured redshifts be so incredibly discordant? NED lists the redshift of the larger galaxy at 0.034377 z which would place its distance at over 595 million light-years from Earth using a so-called Hubble Constant value of 55 (km/s)/Mpc. The smaller object is listed as having a redshift of 0.156215 z. This indicates a supposed distance of almost 2.488 billion light-years from Earth. This is over 4 times the distance of the larger object! Because of the poor quality of the photographs available today one could argue that there is no clear connection between AM 2052-221 and its companion object. But if there is a connection, the implications in regards to the assumed meaning of extragalactic redshifts and their supposed relationship to the Big Bang Theory is so great that one would think that better observations would have been made by now. 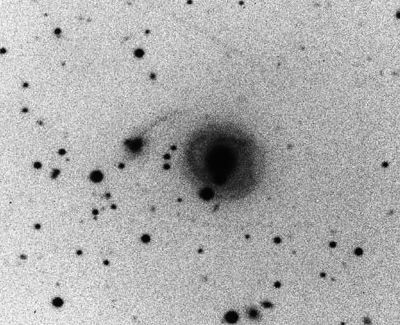 Yet, as with NGC 1347, the best image I could find came from observations made over thirty years ago from a telescope less than a quarter of the size of those available today. Once again I was unable to find any images of from any modern large telescope that covers the southern hemisphere including the SALT, the Gemini South or even the HST. In the little time I have had to research procuring observational data from some of the world’s largest telescopes I have learned that it is an extremely tedious and arduous process that is obviously not geared toward the casual astronomer. However I will continue to pursue new data and I will report any new findings. I still believe the powerful optics of these telescopes could one day help finally bring to light the true connection between extragalactic objects and the true meaning of their discordant redshifts. And as always, I encourage all visitors to this site to pursue their own observations and feel free to contribute to those posted here or even submit new ones.